First Steps Wellness and Recovery Center is a beacon in the night for those struggling in the abyss of addiction. It is a place where addicts can find love, acceptance, and a place to be amongst friends. Terry Collison, the director of the center located at 730 7th Avenue, makes no bones about the fact that the people who visit and hangout are her babies. This is a labor of love for the director and those who help. The center interacts with 75 to 100 people a day. It is a wonderful thing to see because these people have the weather the storm. Many may be still facing hard times as many are homeless. But as I witnessed Wednesday morning, this building is more than a refuge or shelter from the storm but a place to belong and to be surrounded by friends and people that care. I witnessed people playing card games, using the computer, making long distance calls to separated loved ones, reading books, lifting weights, and generally experiencing life and friendship. According to First Steps: "The Drop In Center provides a safe, structured recovery-oriented environment for peers to raise awareness and become engaged in activities and or services that support wellness and recovery. Educational programs, peer support, computers, television, telephone, ping pong, weight bench, treadmill, exercise bike and other fun activities daily. Hours are Monday, Tuesday, Thursday, and Friday 8 to 4 and Wednesday 10 to 4. Terry Collison is one of the people in The Tri-State making a difference in people's live. It is more than fighting to keep people alive, it is helping to make people's lives worth living by providing a smile, a kind word, a break from the heat and even a cup of coffee. These are the seemingly little things that define people's lives and make the difference between just being alive and living. 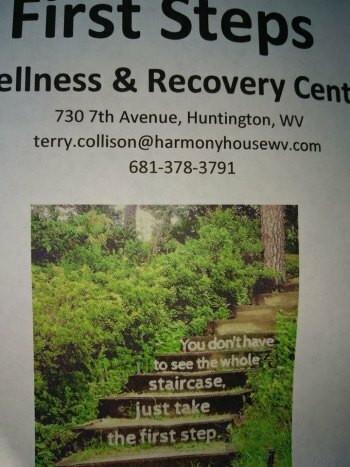 More than a helping hand, Terry Collison is a friend to the struggling and homeless. It is people like Terry and her Co workers and places like First Steps that will help defeat the drug epidemic. It's not always the big epic events that make life worth living, but the little special things that happen in one on one interaction. First Steps is a great example of relationship building and bringing those that have been isolated back into the community.